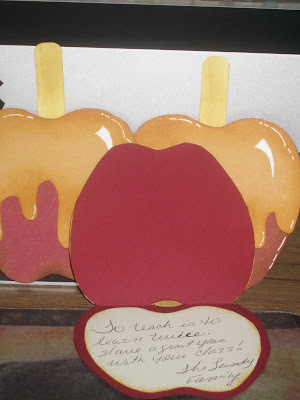 Today I am sharing cards I made for my children's teachers. I copied a sample shown by Lynn Pratt. You can view her original sample here. I used all the same supplies as Lynn, I only changed the inside so that I could write my message. There wasn't any stamping involved in the making of these wonderful Caramel Apples. These cards are so cute. Thanks Lynn.